Chantilly, VA, January, 2014 – Securis Franchising, Inc., a leader in electronics recycling and data destruction services, announced today that it has awarded the first three franchises in the Mid-Atlantic region. 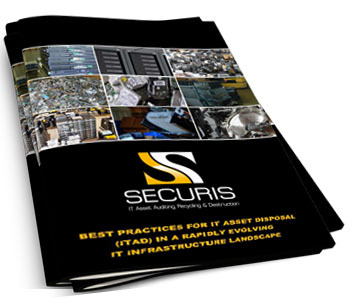 Securis’ franchising strategy is part of the company’s national expansion to serve the growing demand for electronics recycling and data destruction services, a market that is estimated at between $6 billion to over $9 billion globally, according to reports by IDC and Transparent Research. Awards include counties in the Maryland suburbs outside of Washington, DC (Montgomery, Howard, Frederick, Carroll, Washington, Prince George’s, Anne Arundel, Charles, St. Mary’s and Calvert counties) as well as the state of Delaware, with service in these territories slated to begin by Summer of 2014. Numerous additional protected territories are available in Pennsylvania, New Jersey, Washington, DC and North Carolina, with more expected to be released in 2014 and beyond. Demand for electronics recycling and data destruction continues to fuel Securis’ growth. In the U.S. alone, businesses, government agencies and consumers dispose of more than 180 million pieces of electronics gear annually, according to Environmental Protection Agency (EPA) estimates. An April 2013 report by Transparent Research estimates that the global market for e-waste recycling and reuse services is growing at a compound annual growth rate (CAGR) of 13.2% and will reach more than $18 billion in 2017. Those interested in learning more about Securis franchise opportunities can visit www.securisfranchise.com/2014. Originally founded as Securis in 2000 and based in the Washington, DC-metro area, Securis is an industry-leading provider of information technology asset disposal (ITAD), including ultra-secure electronics recycling, auditing, hard drive shredding and other data destruction services for PCs, laptops, mobile phones, servers, monitors, copiers, printers and other data storage devices and electronics waste. In 2012 and 2013, the company was named to the Inc. 500/5000 list as one of the fastest growing private companies in the United States. Securis has earned an R2 certification, the leading standard for the electronics recycling industry, ensuring practices that protect the environment, human health, safety and the security of the recycling process. Additionally, Securis is approved by the U.S. General Services Administration (GSA) and certified by National Association of Information Destruction (NAID) as well as the U.S. Defense Logistics Agency (DLA) Logistics Information Service. Securis is 100% compliant with all U.S. federal, state, and local data security and environmental regulations, covering all business sectors, including financial services, healthcare, government contractors and government agencies. For more information, please visit www.securisfranchise.com.